If you run a venue, hotel, or have a living room that needs a grand piano, these guidelines will help you get a great instrument for the best price. Buying a grand piano is a lot of fun, but if you're going to spend big money on a piano make sure you're not buying a glossy paint job with a rusty engine. Piano salesmen are just as bad as used car dealers. Buying a piano is more than finding something that looks good in your price range. I have over 30 years of professional piano playing experience and have played hundreds of different pianos, including piano disasters in living rooms, on stages, and in hotel venues. 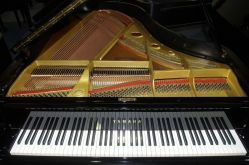 By following these simple guidelines, your piano investment will keep the pianists who play it happy for years to come. Get a good pianist who plays a lot of pianos to give the piano a test run. It won’t take long for them to give you their honest opinion of it, and if they have a hard time talking about it, look at their face when playing because it will tell the story. Your pianist says the piano feels good, so now it’s time to get a piano technician to take a thorough look at it. The piano tech will check out things like tuning pins, action, the strings, and other mechanics. A piano in poor mechanical shape will cost more over the long run because it will take more resources to maintain it than a piano in good mechanical shape. How are the hammers? Can they be shaped or do they need replacement? Is the sound board in good condition? How about the action, has anything had to be repaired that might come undone at a later time? A good piano tech will include all of this and more in his report. The number one mistake is buying a piano based on looks and price. The best looking pianos are sometimes the worst pianos to play. I’ve played a lot of sub-par pianos in high end venues and clubs in my career. My current gig (through 2015) is at the most prestigious hotel in Hong Kong where I play a Kawai grand piano that looks great but is cursed with loose tuning pins which means it goes miserably out of tune if someone sneezes on it. Story goes that it was purchased at a bargain price even at the warning of a piano technician while several very nice pianos offered at substantial discounts from local music stores were turned down because they cost a little bit more. Most venues won’t think about how much their top of the line sound system costs and will have their sound engineers pick equipment that is perfect for the room. However when buying a piano they go for the bargains and pay the price later with higher maintenance fees. The fact is that the final decision to buy the piano, especially in a hotel venue or club, usually falls on someone like the food and beverage manager who’s job is to decide where the money is going. To them, any black shiny piano is as good as another. How do you find a good piano to buy? One of the best ways to find a good grand piano is to talk to some piano technicians/tuners and find out if they know of any pianos for sale. They often do, and often those are the pianos that have been maintained properly and have years of life left in them. If you find a piano at a piano store, treat it like you would a car on the lot. All you really know is what the sales person is telling you and they earn their living on commission from piano sales. All a piano salesman wants to do is move the piano, regardless of it's quality. When you finally do find a piano that catches your eyes and ears, the next thing to do is have a certified piano technician examine the piano and give you a report. The piano technician will be able to go through the piano and discover problems that you can’t tell from playing or looking at it. Like loose tuning pins, problems with the action and other mechanics that might cost a lot more to repair than you’re willing to spend, sound board and harp quality, among other issues. If you’re OK with the report from your piano technician and the price is right, then congratulations, you’ve found your piano. Good luck, bringing a piano home changes everything and makes everything better.